I was perusing Anthropologieâs website this morning and am loving the idea that they have this section called decorating styles. By clicking on a particular styleÂ Â a whole host of lovely products taunt the eye. Are you rustic, classic, city hip, feminine or au courant?Â I have to say I am a bit of everything â although kind of veered towards a cross between classic and city hip.Â I think this is what style is all aboutÂ – not sticking to one particular look but blending a whole host of styles to create your very own individual space. Anthropologie are opening in London this Autumn I do believe â cannot wait! 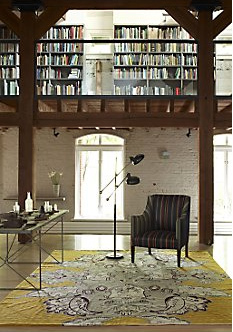 City hip (love the Paul Smith striped chair is softened with a pattern rug and oodles of books – could live here in a nano second.